Within Temptation has been on a bumpy ride in the last few years. With their last album, Hydra, coming out back in 2014, fans were beginning to grow concerned that Within Temptation might not be coming back. They were almost right, as the band had a near miss with the end before vocalist Sharon den Adel released her solo album, My Indigo. Luckily, My Indigo seemed to reinvigorate her interest in music and Within Temptation, so an album was announced for the end of 2018. Due to production delays it was pushed to its current release date, February 1st, 2019. I was a big fan of WT’s material from the eras of The Silent Force (2004) and The Heart of Everything (2007). However, The Unforgiving took a sharp turn towards a more radio-friendly, poppy sound, losing a lot of the symphonics and emotion that make WT what they are to me. Hydra was a step back in the right direction, combining a modern indie/pop sounds with some heavy elements, but still felt a bit overproduced and poppy, particularly in the ballads and drums. With the release of the first new single, “The Reckoning” in 2018, I was immediately curious to hear what Within Temptation would do after the release of My Indigo, which may have gotten the indie/pop out of den Adel’s system. Perhaps they would steer back into a heavier direction at last! 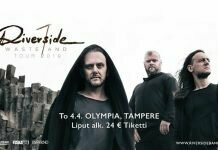 The new songs in their live set at Metro Areena in October did nothing to dissuade my excitement. The album opens with the aforementioned “The Reckoning” and two familiar songs from the live set last year, “Endless War” and “Raise Your Banner” – both songs that I strongly enjoyed in a live context. Better than that, they hold their place with “The Reckoning” in sound and style, heavy enough, but with a nice influence from some of the more melodic aspects of pop music. This could be true of the entire album, as it has a very uniform sound throughout, all of which has managed to be heavy enough to satisfy me in the ways that were left unsatisfied on the past two albums. The addition of vocals by Jacoby Shaddix [Papa Roach] in “The Reckoning” doesn’t hurt either – not a vocalist I’m usually too interested in, but his voice suits this song well. As well, Anders Fríden of In Flames can be heard screaming, “blood for freedom!” on “Raise Your Banner”, and that’s a rather better use of him than his own band has been making of late. They haven’t abandoned their newer poppy sounds completely though. “Higher Ground” and “Firelight”, for example, are a bit more indie-pop, but still manage to fit in it with the other songs on the album thanks to the inclusion of strong drum lines and great musical ambiance, particularly in the latter. 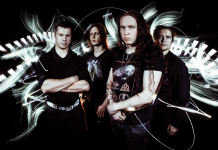 “Firelight” is the third song on the album to feature a guest as well: Jasper Steverlinck [Arid] on vocals. Within Temptation’s ballads have been garnering them a fair bit of attention in the last decade or so, particularly songs like “The Whole World is Watching”, “Frozen”, and “Memories.” They did themselves justice with the ballad on this album, the penultimate “Mercy Mirror”, which had already stood out to me during the live show as one of their best new songs. But perhaps the thing that I like best about this album is simply that the music has some feeling to it again. There are enough growls to satisfy that need and Den Adel has used her deeper range a lot on this album. Better yet, the drums are actually interesting. Pop metal always fails for me when it has disco drums, so songs like “Trophy Hunter” have brought the necessary heaviness back to balance out the pop sound. I think they’ve done a great job of it this time around. Third time’s the charm it seems, as Within Temptation have redeemed themselves in my eyes (or ears) at last. While the album isn’t 100% perfect, it’s easy to put on and listen through it without skipping tracks. Better yet, there are songs that stand out as really exceptional, and I already suspect that “Mercy Mirror” is going to appear in my nominations for Best Slow Song at the end of the year (unless several other bands really knock it out of the park). But, as the first new album I’ve listened to in 2019, it seems this year is off to a great start! I hope these guys continue in this direction in the future.